Koy Blocker a Martin County native was elected and started serving Martin County on January 1, 2015, Koy graduated from Stanton High School in 1983. Koy and his wife Tammy were married in 1985 they have four children. Koy received his Bachelor of Science degree in Agriculture Economics, with a specialization in Agribusiness Management from Texas Tech University in 1988. 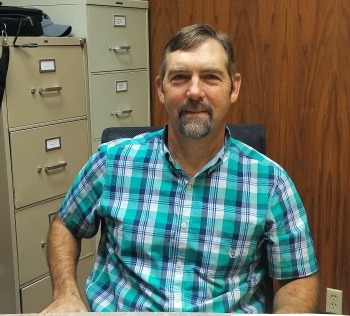 Koy started his career with First Republic National Bank of Lubbock from 1985 to 1990 he continued his career with United Parcel Service in their accounting department from 1990 to 1995, where he was promoted to accounting supervisor. In 1995, Koy moved back to Martin County to become manager and partner of J&K Cotton Farms. President of the Martin County Cotton Growers Association. President of the Martin County Championship Club. President of the Martin County Pullet Association. President of the Grady Booster Club. Secretary/Treasurer of the Martin County Fresh Water District Board. Secretary of the Knott Coop Gin Board. Koy chose to run for County Commissioner because he wanted to give back to the community that has given him so much. His desire is to help Martin County be a strong and prosperous community for many generations to come.